Take a journey through the school playground with the mischievous and imaginative Fink the Mink as he finds trouble and learns tough lessons the hard way. This children's picture adventure book will have your child's eye brows raised at every turn of the page as they are entertai... read full description below. Take a journey through the school playground with the mischievous and imaginative Fink the Mink as he finds trouble and learns tough lessons the hard way. This children's picture adventure book will have your child's eye brows raised at every turn of the page as they are entertained and asking for more with: Full of Color Pictures and Illustrations Every Page is Full of Dr Sues Style Rhymes Mischief That Even Curious George Would Not Attempt Most Importantly Your Child Will Learn a Valuable Lesson on Proper Playground Behavior That Will Ultimately Make Parenting Easier The Misadventures of Fink the Mink is available in print, online through the Amazon Kindle for instant access and for a limited time it is free to borrow for Kindle users. This book is great for teaching children what is right and wrong by example, reading skills and it is a entertaining and fun way to getting the message across. 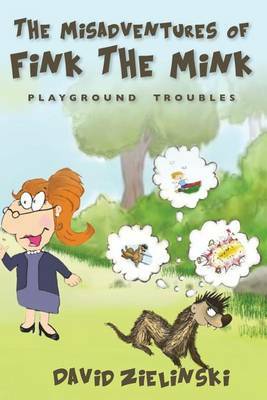 Playground troubles will make a great addition for any: Parent Book Club Library School The Misadventures of Fink the Mink Fink the Mink (Playground Troubles) is the first book of this series. David Zielinski is nobody special, famous or anyone important!